Board members receives 2013 with new members and prepared to celebrate 20 years of the Consortium. 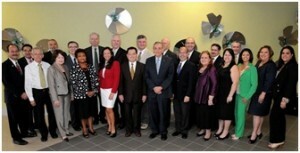 HETS Board Members at the IAUPR, Metro Campus during the meeting. With an outstanding attendance of presidents and representatives from 23 out of 36 institutional members, HETS celebrated its winter Board Meeting on January 17 and 18, 2013 in Puerto Rico. This meeting was hosting by the Inter American University of Puerto Rico, Metropolitan Campus. This Board meeting closes the first semester of the academic year 2012-2013 and receives 2013; a very exciting year for the organization and its members, as HETS’s commemorates its 20th Anniversary and envisions numerous new projects. Additional HETS initiatives shared with the Board included: new services that were added to the HETS Virtual Plaza; the Advanced Certification of the HETS Spanish online workshops ready to be offered this Spring semester; two new online workshops in English ready to deliver in a self-paced modality; five new articles published at the HETS Online Journal on the Fall issue; and 15 presentations selected to be showcased as part of the Virtual Best Practices Conference. During the Board meeting, was distributed the HETS Annual Report 2011-2012. We invite you to access the PDF copy for your information. We look forward to continue strengthening our HETS initiatives this year to foster a greater collaboration among all of our affiliates and widen our partnerships with other organizations. For more information about HETS projects, please contact the HETS office anytime.